Congratulations! You’ve done it. You’ve found the ultimate gift for meatlovers – a Meat at Billy’s eGift voucher. Share your love of all things Meat at Billy’s. What could be better than receiving an eGift Voucher to spend in our online shop! Simply select the voucher amount you wish to spend and you will be emailed the voucher for you to forward on. 1. Add the eGift Voucher to your cart and checkout. 2. Your eGift Voucher will be emailed within 24 hours (excluding weekends) to the purchaser’s email address. 3. 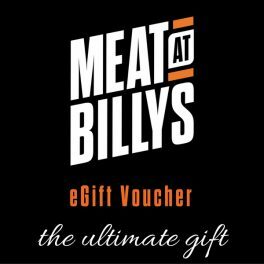 Print or forward the eGift Voucher to the lucky recipient and hope they invite you to dinner after they’ve made their Meat at Billy’s purchases! Looking for an in-store Gift Voucher? Email info@meatatbillys.com.au and we will reply within 24 hours (excluding weekends) OR simply purchase in store from either Ashgrove or Rosalie stores. 1. eGift Vouchers are valid for use on our online store only. 2. eGift Vouchers can not be redeemed at Meat at Billy’s retail stores. 3. eGift Vouchers must be redeemed in full and in a single transaction. No credits given for unused amounts. 4. eGift Vouchers can not be redeemed for cash. 5. eGift Vouchers valid for 6 months from date of purchase. 6. Our usual delivery, return and security guarantees still apply.